[youtube=http://www.youtube.com/watch?v=J21WwPCtF3c] Sydney Harbour, the day after we got home. 1,449 days since heading out there I am back again, just ten days short of an even four years away. It was 1,399 days, or just a day less than 200 weeks, from my arrival in the US to my departure from San Francisco last Sunday. I landed in New York in June 2008 after a near-36 hour day traveling from Bangkok before catching the train to Washington DC, the first of many times I would travel that corridor past the broken factories and over the inlets of the East Coast. I arrived knowing only a handful of people, unsure of what I would do next or where exactly I would end up. I had only a few weeks to figure things out and secure a job offer which would lead to a visa before K caught up with me, just a few weeks to justify the decision to leave so much behind in Australia and strike out to live my dream of working in the US. We spent two years in Washington DC, meeting incredible people and having many side adventures and wonderful experiences. I went through significant adaptation pains at Ashoka, learning to work inside a large established non-profit after ten years as an entrepreneur while teaching an old organization new tricks, but relished the opportunity I had as the first social media director of such an influential and groundbreaking organization, pushing myself, constantly learning new things, working with amazing colleagues and experimenting with emerging forms of media and communications. I am really proud of all that was accomplished during that time, including launching and growing Ashoka’s Twitter account to over 600,000 followers, publishing three ebooks, crowdsourcing a promotional video and generally introducing Ashoka’s many departments and country offices to the power and potential social media and how it could help achieve the mission of creating an everyone a changemaker world. After two years in DC it felt like time to keep moving. We considered New York but decided San Francisco was more our kinda town, a decision we never doubted once we got there. Over two years in the Bay I worked with a number of non-profits to connect their missions with social technologies before launching social good crowdfunding start-up StartSomeGood with my friend Alex Budak who I met at Ashoka, which I’ll be continuing to work on from Australia. We loved San Francisco: the people, the culture, the environment. San Francisco combines the most ambitious people on earth with the most relaxed in a unique, harmonious ying/yang. We got out into the countryside at every opportunity, exploring the hills of Marin and the wineries of the Russian River, staying in Paso Robles, Yosemite and Big Basin Redwoods Forest, driving Highway 1 and hiking Mt Tam. We made and deepened some great friendships, meeting some incredible entrepreneurs, creatives, visionaries and festivalists. We adored our part of the city, the Mission District, which reminded us so much of Newtown, where we had lived in Sydney. And now, somewhat astonishingly, this chapter is over and I’m left trying to make sense of it all. Over the past four years I got married and got my scuba diving license, jumped out of a plane and learned to drive a car, founded a Burning Man theme camp and visited 11 countries, worked for someone else for the first time in eight years and founded a new company, drove across America and bought my first road bike, was granted four different visas and denied re-entry once. I visited 20 American states and wish I’d made it to more (namely: Utah, South Dakota and Louisiana). K made it to 30 over the course of selling her families wine. We had, to sum it up, a really good time. But not without its challenges and set-backs, its moments of frustration, fear and doubt. Such is the rich tapestry of life. Homecoming is always an emotionally-complicated experience. I’m excited to explore Sydney and can’t wait to spend time with my old friends, while at the same time being sad to leave San Francisco and missing my friends back there. Everything is so familiar but at the same time different. I’m obviously older and I hope I’m a little wiser as a result of all these experiences. The relationships I formed will stay with me and I’m so grateful for them. The ideas I’ve been exposed to and inspiration I have gained will inform whatever happens next. Now I want to contribute to the burgeoning social innovation scene in Sydney and while continuing to grow a global community of social entrepreneurs on StartSomeGood. K and I brought something else back with us as well, our first child-to-be, due in August. We never contemplated for a moment taking this next step in our relationships and our lives anywhere other than Sydney, with universal healthcare and our families and friends here to support us. And so on to the next stage. While this particular chapter is over the adventure continues always. Onwards and upwards! I’m writing this on the train from Vancouver back to the Bay Area, sitting in the glass-encased observation carriage as farmlands and forests sweep by, dramatically snow-capped mountains in the distance. We are in southern Oregon and it feels like every few minutes we cross another river near-bursting its banks. It’s all so lush and gorgeous, characteristic of the Northwest Forests I’ve had the chance to experience in recent days. Trains really are the best way to travel. While yesterday I had wifi from Vancouver to Portland this 18-hour stretch from Portland to San Francisco is offline, which I don’t mind as it’s a good time for clearing my head and doing some writing. The past couple of weeks have been unusually stressful, with my visa to re-enter the US initially being rejected, stranding me in Canada with my pregnant wife left back in San Francisco and time ticking down to our departure from the US back to Australia, unable to help with the tasks of relocation or say goodbye to my friends in person. This is all thankfully behind me as I steam towards the Bay, with 17 days once I get there to finish packing and depart. Despite the stress and frustration when in the future I look back on this time I don’t think this is what I’ll remember at all. Instead I think I’ll have overwhelming positive feelings about these two weeks, remembering the incredible support and love our friends showed both K and I, which managed to turn what could have been an awful experience into truthfully one of the most moving and uplifting of my life. When we first announced the visa rejection on Facebook, the response was immediate and near-overwhelming. Offers of support and advice poured in. I was connected to Australian, American and Canadian diplomats, immigration lawyers, and people who had gone through the process before to get advice. I was offered numerous places to stay and people to connect with in Vancouver and Calgary. Our friends in San Francisco really stepped up to help K with packing up our house, at one point she had seven of them working under her direction, or just to deliver her food and offer her company and support. Beyond these specific actions was the unbelievable sense of love, concern and solidarity we both experienced. When we could have felt very alone, kept apart by border and bureaucracy, we instead felt deeply connected to our community. It’s a feeling I will always treasure. Thank you to everyone who reached out and offered comfort during this time. In the most practical and necessary way possible I also experienced incredible hospitality while in Canada. In Vancouver I stayed with a new friend who I had only met at a street party in San Francisco this past New Year’s Day. It’s not as random as it sounds, we share a mutual close friend who was at the party and she spent five years in Sydney previously. While we never met we were part of the same cultural community in Sydney, the outdoor psytrance scene, and this sense of being part of the same tribe, despite having only recently met, was powerfully connecting, even as my intended 3 days in Vancouver stretched to 11. Last Saturday night we went to a psytrance party in Victoria, on Vancouver Island, and the feeling of the community there was reminiscent of the tribe we both missed in Sydney: open, fun-loving and expressive. I had the same experience in Calgary, staying with a relatively recently-met friend who I share many social ties with, both having been part of the beautifully close-knit Burning Man community in Washington DC, but never having lived there at the same time. While in Calgary I also met a group of the local burners (Burning Man devotees) and the ease with which we bonded was both unusual and yet also expected. The lesson: when you are part of the same tribe, you take care of each other. I’ve thought a lot about tribes over the past several years, and it’s my belief in the power and abundance of our communities that inspires me about crowdfunding (or tribefunding as I increasingly think of it). I believe a deeper sense of tribe is only possible when you share a form of cultural expression which is sub-mainsteam. In other words it is sub-cultures that form community. Sub-cultures tend to be based on participation, whereas mainstream cultures are based on consumption. Once a culture gets too big a certain level of intimacy and sense of connection and participation, of having something important and vital in common, gets diluted then lost. You can feel this even in San Francisco, where Burning Man culture has become mainstream, and the truly tight-knit communities are the next sub-cultural level down, groups of burners based around specific camps or sounds. I also had the chance to connect with my other community, social entrepreneurs and changemakers, when I presented at events in Vancouver, Calgary and Portland, and loved the energy and passion of the people I met. I hope we’ll be able to support many of them on StartSomeGood soon. It is my connection to these tribes, my pursuit of the subcultures I love to participate in, which has provided a platform for my last four years in America, which has allowed me to quickly make friends and find community in each city I arrive in. I am so grateful for the support of friends new and old over the past couple of weeks, and for the tribes and cultures which connect us. “True [dance] music consists of four main ingredients: a cup of spirituality, a tablespoon of love, a dash of togetherness, and a pinch of soul-penetrating beats.” – Bamboo Forrest. I was meant to be at SXSW this weekend, co-facilitating a "core conversation" on Monday with Stacey Monk from Epic Change about "positively inspired change campaigns" and hosting Pitch Some Good at Center61 that night. And seeing old friends and making lots of new ones, being overwhelmed by the options for free events and parties, listening to some amazing innovators and storytellers and seeing the latest in technology and marketing. You know, SXSW! But instead I'm here in Vancouver writing you this note to say I'm not making it. 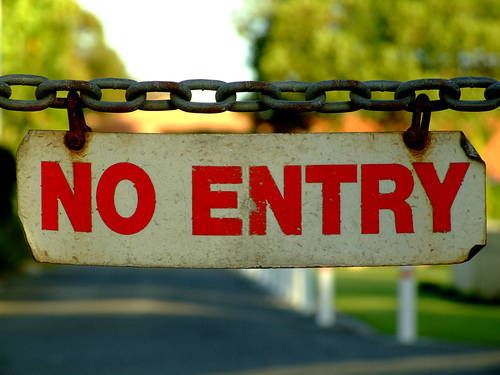 My plans were thrown completely off-course last week when I was rejected for a visa to re-enter the US. Not only did this make SXSW almost impossible, it looked for a time like I wouldn't get back in at all to help K pack up our house and say goodbye to all my friends in person before our move home to Australia April 1 (so soon!). The good news is on my second attempt on Wednesday in Calgary I was approved. Not only did they give me the single-entry visa I was asking for, they gave me a 5-year version. Which is awesome, but kinda weird to go from not allowed in at all to free to come-and-go for the next five years. Not that I'm complaining, but it does prove my point about the validity of my case and how I probably should have been approved in the first place, in which case I would have been in Austin by now. But at this stage, having only got my passport back yesterday, is too late for me and SXSW this year. StartSomeGood is a bootstrapped startup and as such my co-founder Alex and I mostly pay our own way to events such as this. After two return Vancouver-Calgary trips in the past week and a second $140 visa appointment fee, combined with the brutal cost of the last-minute flights available from here to Austin, I came to the sad, but accurate, conclusion yesterday that I just can't afford it anymore, especially with the impending costs of moving home and re-establishing ourselves in Australian in anticipation of the arrival of our first child in August. So here I am, 2,574 miles from Austin and the event I had such a blast at last year and was so looking forward to this year. But this isn't meant to be a mope, just an explanation I can link to as I keep getting tweets and messages asking me where I am. I'm a got lemons/make lemonade kinda guy, so my fall-back plans are pretty excellent. I'm about to head over to Vancouver Island for the weekend to get some nature (and some good music) into me, both of which I crave after the intense stresses of the past week. The forest is where I go to unwind and this, more than the frenetic exhilarating intensity of SXSW, is probably what I need most emotionally right now. On Monday I'm catching the train to Portland where that night the Social Media Users Group at Collective Agency, run by my good friend Todd Pitt from Zero Strategist, are kindly hosting a social entrepreneurs salon for the occasion. If you in Portland please come along and if you know someone else who would find this interesting please send them the details. I've never been to Portland and am really thrilled I get to check it out, even if only briefly (24 hours before back on the train to San Francisco) in the final weeks of our time in the US. And I love a good train trip, probably my favourite way to travel. So that's what's going on - thanks for asking! If you are in SXSW please check out Pitch Some Good on Monday night at Center61 - RSVP and details here - where 8 social innovators will share their story and ask for your support. The event features a live crowdfunding exercise which will determine which of the ventures gets the $1000 main prize contributed by RackSpace, in addition to the funds donated by the crowed on the night. Whatever you are doing this weekend, have an amazing time. Sydney: Monday, April 11 - 6PM, at the Vibewire Enterprise Hub. Hosted by The School for Social Entrepreneurs and Vibewire in celebration of Vibewire's 10th birthday. This one's really special for me, hard to believe it was over a decade ago that a few friends and I naively incorporated Vibewire and embarked on a great adventure. RSVP here. Melbourne: Wednesday, April 13 - 6:30PM at The Hub Melbourne. Hosted by The School for Social Entrepreneurs and The Australian Centre for Social Innovation: “Crowdfunding for Good: A panel discussion with StartSomeGood, Pozible and the Awesome Foundation.” RSVP here although the event has sold out. It's free tickets though and you know how those things go: some people won't show up. So if you're keen I would still rock up and try to get in. I'm also meeting friends for drinks and pizza afterwards at a pub nearby, message me if you want the details. Adelaide: Thursday, April 14 - Adelaide, 5:15PM at. Hosted by The Australian Centre for Social Innovation: “Adelaide Social Entrepreneurship Meetup with StartSomeGood.” RSVP here. All events have a social change/entrepreneurship/crowdfunding focus but the Vibewire birthday event will be the most wide-ranging, a chance for me to reflect on what we did and didn't accomplish during my time at Vibewire, to share some of what I've learned in fifteen years of organizing and outline what I see as the big challenges in need of champions now. In Melbourne I'm very excited to appear alongside founders of two organizations I greatly admire: Pozible (Australian creative crowdfunding innovator) and the Awesome Foundation Melbourne (a member of the wonderful and growing Awesome Foundation movement). Looking really forward to hearing their stories and perspectives and to together exploring the opportunities and challenges of creating new funding mechanisms for innovators. My only regret is I didn't manage to fit Brisbane into the schedule. Next time Brisvegans! Monday, April 11 - Sydney, 6PM. Hosted by School for Social Entreprneurs. ”SSE Fellows and Vibewire 10th Birthday Celebration.” More details here. Wednesday, April 13 - Melbourne, 6:30PM. Hosted by The Australian Centre for Social Innovation: “Crowdfunding for Good: A panel discussion with StartSomeGood, Pozible and the Awesome Foundation.” More details here. Thursday, April 14 - Adelaide, 5:15PM. Hosted by The Australian Centre for SOcial Innovation: “Adelaide Social Entrepreneurship Meetup with StartSomeGood.” More details here. Oh blog, I do neglect you so. Sorry friends and readers! The last month has been an exhilarating, exhausting and slightly manic time. 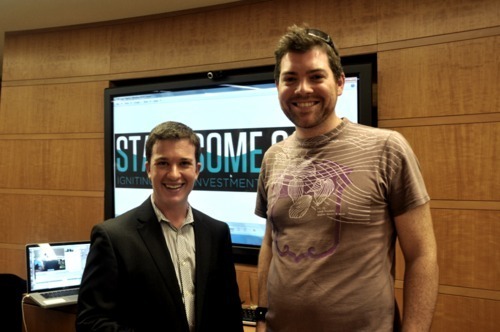 I started my new job at HopeLab then launched StartSomeGood.com one week after that. A week after that I left for 10 days to South by Southwest Interactive in Austin followed by the Nonprofit Technology Conference in DC, both amazing near 24-hour-a-day festivals of ideas, technology and connections. So of course as soon as I was back in San Francisco my body got its revenge for all I had put it through by promptly getting sick, something I’m just recovering from now. And next week I leave for a week in Australia! As I was telling a friend yesterday: when my life isn’t overwhelming I tend to make it so but sometimes in the midst of it I wonder if this is really the best way to live. But truly I do love having things to keep me busy, new ideas to explore and causes I care about to promote. HopeLab are being a wonderfully supportive home for me (this is what greeted me when I arrived this morning) and I’m really excited for the unique and inspiring work we’ll be doing this year. Keep an eye out for our Joy Campaign (or, better sign up for an alert when it goes live), which is launching soon and will be a lot of fun. There is a depth and intention to HopeLab’s work which I have rarely felt. A disciplined focus on where we believe we can make the greatest impact but also an enormous generosity in supporting the personal development of our staff and in sharing what we’ve learned with anyone interested. My job is to innovate around this sharing, seeking new ways of telling our stories, disseminating our research findings and foregrounding our culture. My colleagues are, everyone of them, kind, patient and enthusiastic. Meanwhile StartSomeGood has gotten off to the kind of start I could only have dreamed of. Our launch party in Washington DC during NTC was incredible: an amazing collection of friends, past colleagues from both Ashoka and Small Act, NTC attendees and StartSomeGood partners and ventures. The energy was, truly, magical, filled with a shared vision for change and a sense of infinite possibility. Huge thanks to our sponsors Gotham Wines, Tevolution, nuubiachocolat and our very gracious hosts the Case Foundation. You can see more photos and read a recap on the StartSomeGood blog. The activity on the site is equally inspiring. Our first two campaigns have ‘tipped’, that is reached their minimum goal to guarantee they get paid-out: HairFlare for Hope and Pick Up America’s The Bagabonds. Several other great campaigns are charging towards their tipping points including Creating the Future, TakeAShine and Partnered for Success. Please check out these great campaigns and the others on the site – I hope you find something you are inspired to support! I am back in Australia in a week (for a couple of weddings) and will be doing speaking engagements in three states to promote StartSomeGood, as part of our launch of non-US ventures. In Sydney I’ll be attending Vibewire’s 10th birthday celebration, which honestly blows my mind. I’ll be posting the details of all the events shortly, I hope to see many of you at some point during my too-brief visit. Much as I loved my recent conference-hopping (I have wanted to attend both events ever since getting to the US) and I’m excited for my visit home and the events I’m doing, and I cherish the wonderful people all this movement brings me into contact with, I’m looking forward to getting back to San Francisco and being still for a little while (apart from a long weekend at Yellowstone in May). I’m looking forward to digging in and creating an impact at HopeLab, really taking the reins of our digital communications and strategy. Most of all I'm looking forward to constructing a sustainable life for myself that balances and honours my commitments and relationships in a way that is impossible when you’re constantly coming and going. In July of this year, as part of our move to San Francisco, K and I, along with our friend J, drove from Washington DC to the West Coast. Driving across America is one of the best travel experiences I've had. America is a huge country, as wide as Australia but with geological diversity beyond that contained by our island. North America is a young continent and it feels this way, both culturally and, especially as you head West, geographically. The land bucks and meanders, evidence of the slow but epic collision between the East and West coasts, the glacial grinding of the last ice age, volcanic activity and tectonic ruptures. And as is true in many human fields America has numerous biggest, oldest, and oddest, from 4,000 year-old trees to canyons too large to comprehend. The country has an epic vibe to it, which perfectly suits the objection of driving from one side of a continent to the other, spurred on by dreams of success and adventure. And across this great land sprawls the America nation, ugly and garish as it often looks from the perspective of the Interstate this human culture teems with a diversity and uniqueness to mirror the continent it was forged on. Driving South-West from Washington you're struck by how lush and bountiful the land is. It's an agrarian idyll of tobacco and wheat fields when it's not what my father calls "house farms", farmland which now sprouts only identikit McMansions, already a relic of the housing boom which produced them, ill-suited for the coming century. Once we slipped into the Shenandoah Mountains we were treated to a different perspective, of how this all must have looked five hundred years ago; dense shady woodlands where the awnings meet in a swaying contact dance, the shrouded forest flour a soft layer of decomposing plant matter. We camped at Peaks of Otter campground which a friend had recommended. It was genuinely lovely and, on this Sunday night, only about 10% full. It was my first experience of camping in an American National Park and I was very impressed. The camp grounds were spaced out so that even when full campers wouldn't be on-top of each other. Each plot had flat ground for one or two tents, fire pit, table, bench and a spot for a car. Everything you need. It's not the same as camping in genuinely isolated locations with no-one around of course, but for car camping on the move it's perfect. From Virginia we moved into Tennessee where we saw the obligatory country band in Nashville before moving on to Memphis where our priorities were: 1) Gracelands (at whose camp grounds we would be staying); 2) The National Civil Rights Museum and; 3) BBQ. Given that we were camped at Gracelands we decided to strike out for the Museum first, optimistically hoping that there might be enough time to see it and get back for a tour of the Mansion. 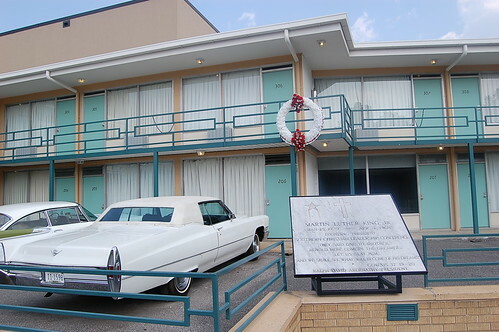 The National Civil Rights Museum is contained in the Lorraine Motel, where on April 4, 1968 Dr. Martin Luther King Jr. was assassinated as he stood upon the balcony. The balcony where Dr. MLK Jr was killed. 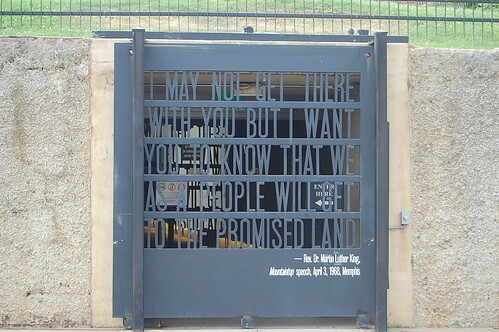 "I may not get there with you..." - from MLK's speech the night before his assassination. It's a pretty reverent place, and somewhat overwhelming to dwell on the fact that here one of the great leaders of last century was struck down, and what might have been possible had he not been. It was also, unfortunately, closed, as, it turns out, it always is on Monday's. We had a wander around the neighbourhood, stopped for a smoothie, then headed back to Gracelands, just in time to miss the final bus over the mansion by, I swear, one minute. And despite the mansion just being across the road and us already having bought tickets to the tour there was no way for us to catch up. Resigned, we took our refund and comforted ourselves with thoughts of the delicious meal we were going to spend it on. A friend who previously lived there had recommenced Rendezvous as the “best ribs in Memphis” (I bet this is a good way to start an argument in Tennessee) and we were keen to check it out. I had begun to feel the worst for wear, even after a nap, but we were determined to make something of our visit to Memphis and so made our way downtown. No good, I tried to eat but only felt worst and had to get the ribs in a carry-out box and rush back to camp. What a disaster. Tourist fail. 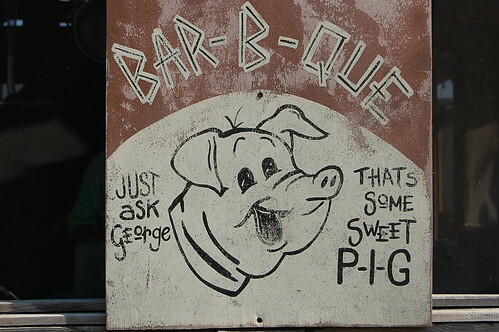 Tennessee loves them some BBQ. Just ask George. There was no chance to try any of this again the next day as we were picking J up from Little Rock Airport that morning. With a third driver we had a more ambitious schedule planned but this didn't stop us detouring off the forsaken interstate and through the fantastically kitsch-but-run-down town of Hot Springs. 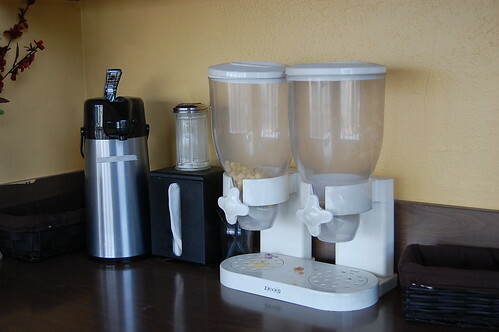 We spent one night in the best value roadside motel in Clinton, OK, then across the Texas Panhandle in a single push and onwards to Taos, New Mexico. Numerous people in DC had warned me about driving across the Texas Panhandle. “It's so big and boring” they would say. First of all, it's not big. From Oklahoma to New Mexico was about a five hour drive. Half of Australia is roughly as featureless as Texas, four times longer, and I've driven across that four times. But more to the point, I didn't think it was boring. Or, rather, I didn't mind that it was boring. I used to really enjoy those drives from Sydney to Perth and back with my family, and the monotonous terrain was part of what I enjoyed. I've always really liked deserts from this reason. I find them really relaxing, it feels like you can unpack your brain into all that space, allow your thoughts to meander with less visual distraction. America is almost unbelievably fertile and dense. Town after town, city after city rolls by the Interstate, wheat, corn, tobacco or some other crop usually stretching to the horizon in-between. Everywhere people. Driving across Australia you can literally drive all day while seeing only four gas stations and 16 letterboxes, standing next to driveways that stretch off further than you can see. There's nothing that approaches this desolation in America, not even in the deserts of the West Coast, and in the Eastern half of the country you're only rarely out of site of buildings unless you're in a National Park or reserve. 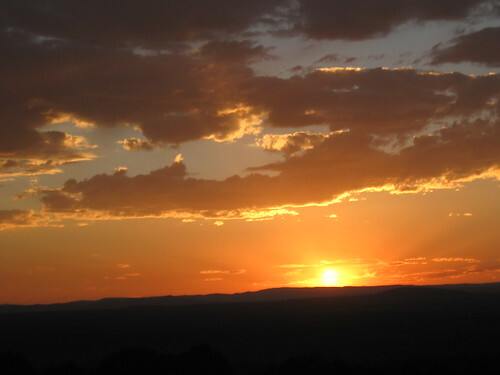 After Texas we headed north through New Mexico, magically arriving above our destination, Taos, just at sunset, as the last rays of the day streaked the clouds orange and made the walls of the mountains around us glow red. It was lovely. 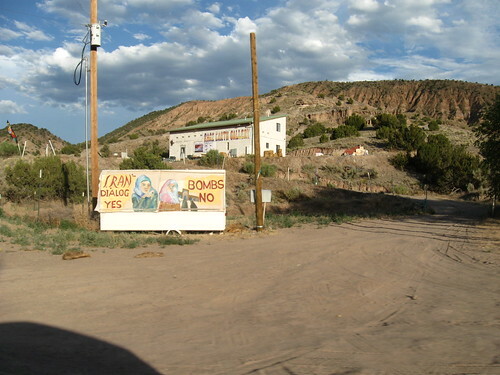 Taos itself is a lovely bohemian town filled with art galleries. The center of town featured large squares, parks and narrow streets with side walks. It was very social and walkable, people sitting in outdoor cafes, walking their dogs or chatting in shop doorways. It was the opposite of 90% of the towns we had seen, where all the action was in the strip malls on the outskirts of town, the shops pushed back from the road by the huge car parks, designed to be accessed only by driving, each mall indistinguishable from the others except for the exact composition of fast food joints and chain stores. The downtown, when we saw them, were often boarded up and near-deserted. We took our first day off of the trip and wandered around town. It was really nice to not be in a rush and to have nowhere in particular to be. We had great margharita's and watched Lyrics Born perform a free concert in the park. The next morning we had a look at the Taos Pueblo, a World Heritage site which had been continuously occupied for over 1,000 years and is a gorgeous maze of semi tumbled-down but still lived-in adobe dwellings. 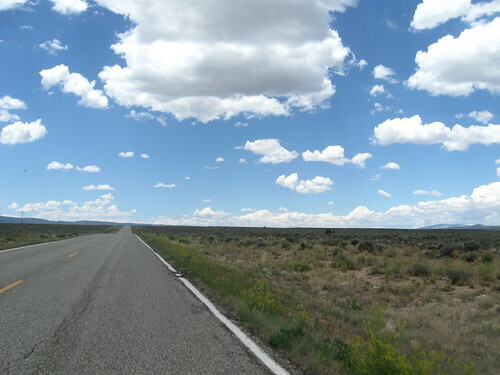 Then we were away on a beautiful and epic drive (our longest of the trip) to the Grand Canyon, through Northern New Mexico and Northeast Arizona. The scenery was incredible. At last we were seeing more and more open space, with only the occasional small town to interrupt our view. The first six hours were through steep mountain ranges covered in pines, past lakes and boulders. The second half it was red soil and tabletop Mesa's, the landscape of the classic Wild West films. 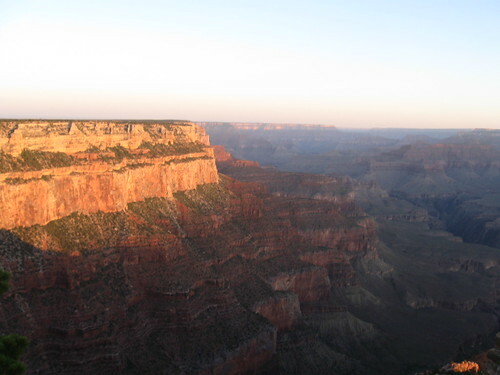 The Grand Canyon is really big. I mean, really big. Huge. You could drop a whole bunch of other big things in there and have plenty of space left. I mean, it's really epic. I don't think it would be possible to be disappointed by the Grand Canyon. The scale sends your mind reeling; it's impossible to comprehend. The gradients of colour and terraced cliff faces are stunningly beautiful and absolutely mesmerizing. We arrived at around midnight during a full moon and first saw the canyon basked in its dim glow. Even lacking the depth and contrast of daylight it was extraordinary. There was no-one around, just us and the wind on the edge of a silent void. We camped for all of three hours, getting up at 4am to get in position for sunrise. It was an incredible experience to watch the sun peek over the cliffs at exactly 5.14am and colour slowly return to the canyon walls. There were only about a half dozen others there and we all sat in silence and watched it in awe. Truly a highlight of the journey. The Grand Canyon is surprisingly well-managed. Unlike the Niagara Falls (on the Canadian side mind you) which is a scrum of casinos and hotels right next to the main attraction, jostling for water views, and massive tour bus after massive tour bus disgorging tourists right on the spot, many of the best lookouts are only accessible by the free shuttle service run by the park, putting a cap on numbers even at the busiest periods (although creating lines at some bus stops). As with elsewhere the National Park camp grounds were well laid-out and maintained. Impressive. 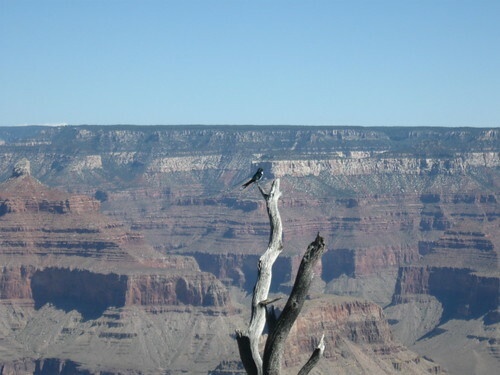 From the Grand Canyon we drove to Las Vegas for a forgettable night in a casino then on for what would be the best day's drive of the trip: Reno to the Sierra Nevada's via Death Valley. This is a drive that really sums up the incredible extremes and experiences of America, taking us past the lowest place in North America (282 ft/86 meters below sea level in Death Valley) and then, two hours later, the highest place in the lower 48 states (Mt Whitney in the Sierra Nevada range, 14,494 ft/4,418 meters). We would go within a handful of miles to the oldest organism on the planet, the 4,700 year-old Ancient Bristlecone Pine and the world's largest tree's, the 300 ft-tall giant sequoia's. 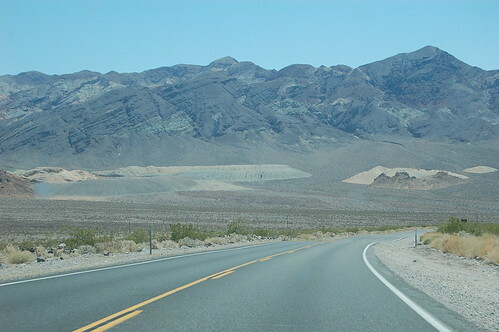 Death Valley is also where the hottest temperature was ever recorded in America, 134F/56C, in 1913. It was a mere 118F/48.5C the day we were there. It was like stepping into an oven, my mouth dried instantly and sweat disappeared almost as quickly as it could form. It was a dry, relentless heat, which sat like a blanket over the stark white desert. We experienced the heat in full by following the instructions of a sign which suggested turning the air conditioning off so as not to risk overheating the engine. I half expected a “just kidding, welcome to Death Valley” sign 10 miles down the road but it never came. The terrain alternated from folded rock hills to salt flats to sand dunes, with an oasis or two adding patches of green to the bleached landscape. It was very beautiful, and I felt thrilled to have had the genuinely new experience of experiencing such intense heat. Coming out of Death Valley you go from below sea level, up and over a 7,000 ft pass, back to near sea level as you cross a flat valley then over another, even higher pass, through a pass in the well-named and seemingly-lifeless White Mountains only to see the Sierra Nevada's, a line of mountains all over 10,000 ft marching North-South before us, blocking all progress to the West. It's a wild and exhilarating drive, full of hairpin turns, sheer drop-offs and epic views. We turn North, shadowing the eastern flanks of the mountains. The nearest pass to the West was 150 miles to the North, through Yosemite National Park. 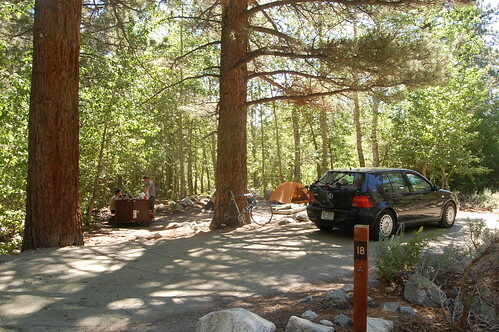 We spent two nights at the Big Pine Creek campground, not far from Bishop, nestled in the folds of the Sierra Nevada's. The Western slopes of the range is lusher and more famous with Kings Canyon and Sequoia National Parks alongside it. The Eastern side is in the rain shadow so the slopes are largely bare, the vegetation more hardy and modest. But looking up from our campsite to the snow caps of the mountains directly above us, an ice melt-fed stream absolutely smashing its way down the valley fold alongside us, it was more than beautiful-enough. We had our second day off here, going for a hike, taking refreshing dips in the freezing-cold stream, playing with circus toys, reading and napping. It was very relaxing knowing we were within an easy drive of our destination and the weather was perfect, warm with a breeze by day, cool enough to enjoy the fire by night. Finally our journey was coming to an end. J had a 2pm flight leaving from SFO and we were flying to Australia to get our new visas that very night. Even this final drive was filled with delights. Seeing more of the Sierra Nevada's on our way North, going West across Yosemite (where I saw beavers!) and crossing the agricultural middle of California, seeing grape, orange and wheat fields. Then onto a 10-lane freeway and into San Francisco we swept. We had crossed 9 states and the District of Columbia, driving over 3,500 miles in 11 days. I'm so glad I was able to do the great American road trip while I was here and see some of the parts of the country I've only ever flown over. I'd absolutely recommend the drive to anyone who has the time to enjoy it. I only wish we'd had twice as long! You can see a larger collection of photos here. Oh blog, and blog readers, I've ignored you for so long. My apologies for the long break between posts. The last couple of months have gone by in a flash, a nearly-hallucinatory slideshow of people, places, goodbyes, hellos, endings, beginnings and movement, always movement. Until finally I stopped. I've been in San Francisco for three weeks and feel myself slowly settling in. K and I have been enjoying a really simple life these last few weeks: pottering around the house, working from home, shopping for bulk goods and cooking every healthy meals at home, barely eating out. We really needed this slower time after a fun but relentless and at-times spectacularly stressful previous three months which involved 3 countries, ten states, six flights and one epic drive. Then a final week in DC, party party party pack pack pack, and we were on the road, driving South through Virginia at first and spending our first night in the George Washington National Forest, part of the ancient Appalachian Mountains that run down the East coast. Staring up at the stars that night I felt the thrill of freedom that everyone must feel when they set out on a cross-country adventure. We took eleven days to cross the continent, enough time to do things other than drive. 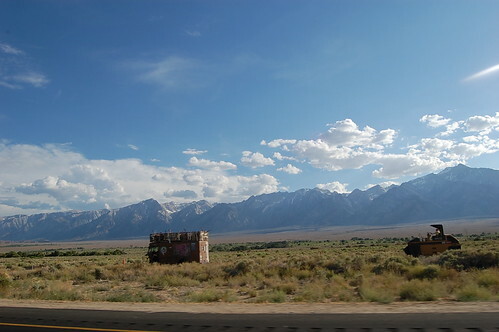 Twice we took days off, first in the bohemian Taos in New Mexico and then in the Eastern Sierra Nevadas in California. We spent two days driving due West across Tennessee, arriving at all our chosen attractions just after closing time or on their day off, then spend across Arkansas, Oklahoma and Texas. In Little Rock we picked up a traveling companion, our friend James, and in Clinton, OK. we spent the night in the perfect old-school roadside dive motel. We were in awe of the Taos gorge and then had our minds blown by the Grand Canyon over which we saw the sun rise after three hours of sleep. In Death Valley we experienced 119 Fahrenheit (38.5 Celsius). (That was particularly amazing, the hottest temperature I've encountered, a genuinely new feeling.) We plunged into a freezing-cold stream of ice-melt pouring down off the Sierra Nevadas and saw the highest and lowest points in mainland USA within 2 hours drive of each other. I saw five animals I had never seen in the wild before: a hummingbird, coyote, elk, praire dogs and beavers. America is a spectacularly large and diverse country. Mainland USA is as spread out as Australia but with a staggering degree of geographic diversity. 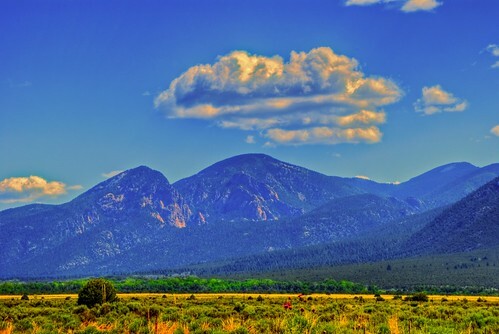 Ancient mountain ranges (the Appalachians) and much more recent upheavals (the Rockies), huge plains and vast canyons cut into plateaus four thousand feet high. America is a relatively new continent, the land subject to the repeated trauma of tectonic collisions, volcanic instability, ice-age glaciers and resulting floods. It was thrilling to see the land morph so dramatically around us, often in the space of a few hours. All in all, an amazing drive. We arrived in San Francisco around 2pm, had time to visit a friends house and have a shower and then left the car in long-term parking and caught a flight back to Australia, whereupon landing we dashed immediately to the US Consulate for our visa interview, arriving with seven minutes to spare. Stressful. But new visas we did receive, allowing us to work in the US for another two years, and we were both deeply relieved despite our outward (and well-deserved) confidence. The rest of the week was spent focused on family and some very special friends. Then back to San Fran, landing at 10am and seeing our first apartment at 12pm, the first of ten we would see over the weekend before I flew out on an overnight flight back to DC to start my work for Small Act at the Virginia HQ. Naturally it was the eleventh house K saw, the morning after I left, that she fell in love with and so when I returned that Friday night it was to our new place in the Mission, which was pretty cool. And the house was every bit as great as described, cozy, large and filled with character, not to mention exactly where we wanted to live, in the Mission near SOMA (where I'll be working). And that brings us roughly back to now, thanks for sticking with me. Having got you up-to-date I'm going to return to the irregular-but-somewhat-frequent-updates-on-whatever-I'm-thinking-about that constitute the usual programming around here. Photo by Jim Nix, flickr. Kate and I have just got back from a week spent back in Sydney visiting family and friends. It was our first visit home since we left in April last year and was every bit as wonderful and as rushed as you would imagine. One week to see so many people we care so much about was nowhere near enough, and there's people I badly regret missing. But, in general, those we saw where those we most needed to see, our closest friends we used to see on the most regular basis and, of course, our families. Flying back into Sydney was stunning. I've been to quite a few cities but I've never seen one as blindingly physically beautiful as Sydney is. It was heart-stirring to see the sunlight glinting off a harbour dotted with small sail boats and ferries, eucalyptus trees greening the suburbs on its banks. Given Sydney had only just emerged from winter the weather was brilliant – sunny and warm but not too hot. Few cities can compare to this. But even more heart-stirring was seeing our friends again. As wonderful as the people we've met in Washington DC are there's nothing like being back with old friends, a coherent crew of people who know and love us, and who uplift and fulfill us. Such friends make life fantastic, and we miss them all enormously. We truly felt we were home. Flying back into DC was an amazing feeling too though, as I realized that DC is also home for now, that we have people we miss here and who miss us, and that I was looking very forward to getting back to our house, our neighbourhood, our friends and my work. I think it's only in leaving then returning to a place that you realize what it means to you. It's good to be home. Just a note to confirm that I made it through Burning Man alive (so alive) and am now back in Australia being run off my feet trying to catch up with as many family and friends as possible in the one week we're here. I spent a glorious 2.5 weeks completely unplugged: no internet, no phone. Highly recommended. We're back in DC this weekend so I'll return to regular posting after that but will try and get an update up before I depart.